We chat with Joon-ho Bong about the unusual cast of characters that populate his latest film. In an extreme departure from his Captain America persona, Chris Evans abandons his patriotic shield and picks up a mean-looking ax instead as Curtis, the rebel leader of dirt-faced proletariats determined to overthrow society because they're too tired to be afraid anymore. 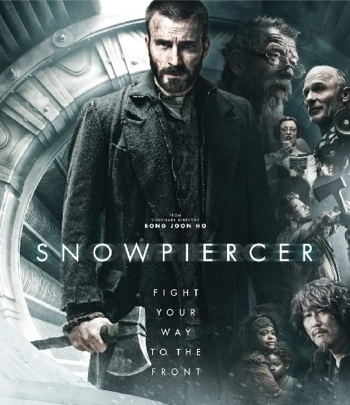 The strange thing is, Curtis, his fellow would-be revolutionaries, and the bougie scum about to go the way of the dodo all reside on the same train called Snowpiercer -- the only place on Earth still hospitable to humanity. The film's deceptively simple plot hinges on the rebels' efforts to kick, hack, and outsmart their way from the caboose to the enigmatic but evil conductor's car. Among Curtis' obstacles is a preening but terrifying bureaucrat played by Tilda Swinton, virtually unrecognizable in a nightmarish Margaret Thatcher costume. But Curtis encounters difficulty holding on to his allies, too; his most important asset in getting from car to car is a cranky, curse-prone drug addict (South Korean superstar Kang-ho Song) who truly doesn't appear to care whether he lives or dies. 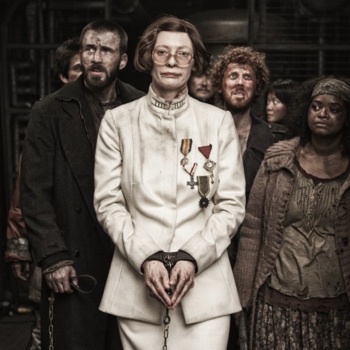 Snowpiercer was a project born of love at first sight. South Korean director Joon-ho Bong (The Host, Memories of Murder) reportedly devoured the 1982 French graphic novel Le Transperceneige in one sitting at his regular comic-book store in Seoul, then shared it with Oldboy director Chan-wook Park, who promptly secured the film rights for his friend. If you've kept up with news of Snowpiercer's difficult behind-the-scenes drama, you already know that Bong and producer Harvey Weinstein disputed for months over the editing of the film. Rest assured, the version of the film to be released in theaters is the director's cut; Bong's rock-solid resolve won out over Weinstein's "Scissorhands." Speaking through a translator, Bong openly discusses why he fell in love with the Le Transperceneige, his influences for the project (including a Pixar film), why he gender-switched Tilda Swinton's character, and why he made Evans' character the Luke Skywalker of the film and Song's character its Han Solo. Inkoo Kang: Why were you so drawn to the source material? Joon-ho Bong: It was just the idea of a train. Many people love trains. In Germany and Japan, there are train "otakus." I also love trains -- I watched the Japanese comic Galaxy Express 999 -- and imagining [being] inside a train for two hours was really exciting. But of course the film isn't about trains. It's really about the people inside the trains. They're the survivors after a new Ice Age begins, and they're fighting inside this train, the rich against the poor. So there was a sociological and political aspect to this story as well, which was also exciting. Inkoo Kang: Do you have any thoughts on why so many dystopian movies are about social inequality? Joon-ho Bong: It's a relevant theme that still affects us today, the way the ideas of class and revolt developed in tandem with human evolution. It's a consistent issue for humans living in [any] society, whether it's slaves revolting, the class struggle, or Spartacus.